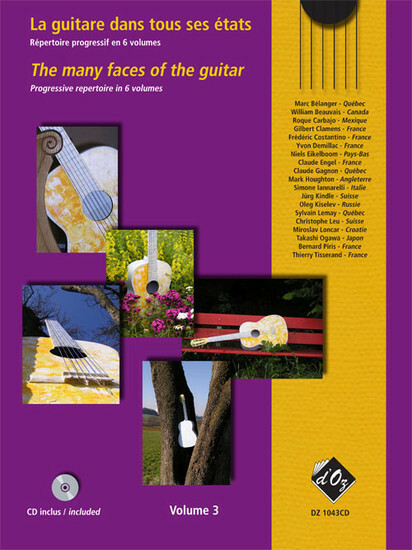 Designed as a follow-up to the Progressive repertoire serie (DZ 101 to DZ 106), Les Productions d'OZ are proposing here a new series entitled The many faces of the guitar. Although the grouping by level has been preserved, the repertoire is made exclusively from original compositions chosen by the composers themselves. D'OZ exclusives chosen among older publications are here side by side with completely new pieces. The d'OZ catalogue is full of little treasures written for all levels by guitarists, composers and teachers dedicated to the cause of classical guitar. The title suggests an optimistic portrait of the instrumental practice in many region of the world, and the scope of the "family" of composers who are regular d'OZ contributors. The crossbreeding of genres and countries are bringing an international flavour that makes these works so special. It is with an opened mind that I have engaged myself in this ambitious project of recording the music of the six volumes. I have been seduced by the melodic qualities and the effectiveness of the various guitar techniques involved in these works, and at the same time providing the students a new and interesting repertoire. I humbly wish that the recording that comes along with the book and CD package will inspire some of your performances. The six volumes in this new series of student study pieces (I am concentrating on only four of them in this review) are intended to carry on the good work initially provided by this same publishing house's earlier series of a few years ago, which was a collection of six editions which gathered under the title of Progressive Repertoire. As before, these editions are graded, hence Volume 2 contains material suited more towards the Grade 2-3 student through to Volume 6 which has fewer, but longer, pieces geared more for the Grades 6-7 player. The main difference this time is that the pieces have been chosen specifically by the composers themselves from earlier individual publications and these works now sit alongside some totally brand-new material, presumably written especially for this series (although it ought to be stated that the older, pre-published music far outweights the newer compositions). As with most anthologies, the music can be a trifle inconsistent in quality with some dreary and lacklustre music sitting alongside little gems; but for my part I am pleased to say that I enjoyed the majority of the compositions and found the bulk of the music either entertaining or technically useful or, as in the majority of cases, sometimes both. The musical styles are many and varied, with pieces composed in a traditional flavour sitting alongside works written in jazz, blues, sentimental and Latin mode. At the "easier" end of the technical stakes, composers to make a bee-line for are Juan Manuel Cortes, Takashi Ogawa, Thierry Tisserand, Bernard Piris, Mark Houghton and Yvon Demillac; in the higher standard books seek out Claude EngeI, Claudio Camisassa, Rene Bartoli, David Gaudreau and further contributions from Yvon Demillac and Mark Houghton. Between them they have written some decidedly attractive music which should score highly amongst the student enjoyment stakes. Each of the books has an accompanying CD which contains all the material in each individual volume and is played quite ably by the Canadian guitarist, David Jacques. The presentation of all the pieces is of a high standard and I am positive students will find quite a lot to their liking in the various volumes.